Most muffins are packed with fat, but this delicious savoury muffin recipe is low in fat and makes a great morning or afternoon snack. It’s also makes a great school lunch box snack idea for the kids. 1. Preheat oven to 180C. Place pumpkin into a microwave-safe bowl, cover with water and cook in the microwave for 3 minutes or until slightly softened. Drain and add zucchini, spring onions and spinach. 2. Lightly beat eggs and milk, pour over the vegetables and season. 3. Sift flour and baking powder over the top and stir until just combined. 4. Spoon mixture into baking paper lined, non-stick muffin trays, sprinkling with pumpkin seeds, and bake for 25 minutes or until done. 5. Top with low fat cream cheese and serve. Cooking tips: Also try adding crumble low fat fetta and chopped sundried tomatoes into the mix. Naturopath Michèle Wolff, author of Digestive Solutions, shares an easy January cleanse recipe for detox salad. The salad rids the body of toxins, cleanses your digestive system and gives your body a boost of vitamins and nutrients. Eat it anytime you need a healthy pick-me-up! 1. Combine all ingredients together and serve. You can also add a boiled or poached egg, and goat’s cheese for added flavour. Michèle Wolff is a leading health practitioner and a qualified naturopath, nutritionist, herbalist and nurse, owner of Ultimate Detox Solutions. Her new book ‘Digestive Solutions – 101 Proven Methods to Solve Your Tummy Problems Naturally’ is available from bookstores and good online booksellers. Visit www.digestivesolutions.com.au. 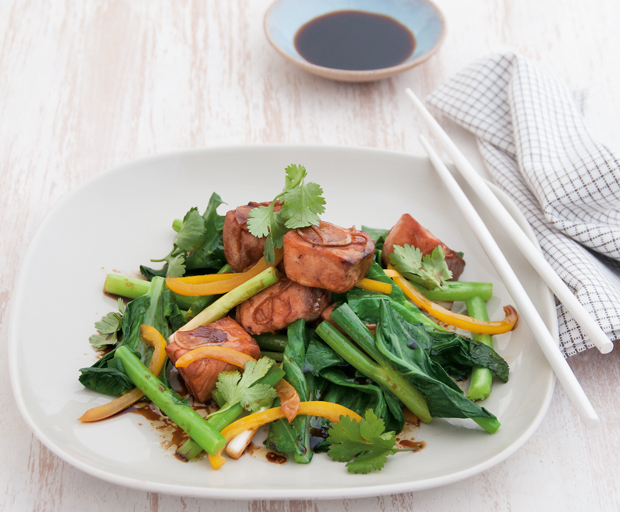 We’re always looking for quick dinner ideas and this Michelle Bridges recipe for ginger salmon stir-fry with Chinese broccoli from her new book Get Real! is not only delicious but low in fat and calories. Winner! Extract from the book Get Real! 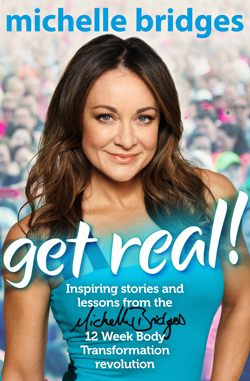 : Inspiring Stories and lessons from the Michelle Bridges 12 Week Body Transformation Revolution by Michelle Bridges and photography by Jane Allen published by Viking RRP $24.99. As with my other stir-fries, you can replace the fish with any kind of protein you like. I would recommend tofu or chicken as alternatives for this dish. 1. Combine the salmon, garlic, ginger and half the soy sauce in a bowl. 2. Heat half the oil in a wok over high heat. Add the gai lan, capsicum and 1 tablespoon water, then stir-fry for 2 minutes or until the vegetables are just tender. Transfer to a bowl. 3. Heat half the remaining oil and stir-fry the shallots for 1−2 minutes or until bright green. Transfer to the bowl with the other vegetables. 4. Heat the remaining oil and stir-fry the salmon for 2 minutes or until lightly browned. 5. Return the vegetables to the wok, with the remaining soy sauce, and toss to combine. 6. Divide the stir-fry between bowls and scatter with coriander leaves to serve. Mish Tip : Gai lan (Chinese broccoli) is a leafy Asian green and, like regular broccoli, it is extremely nutritious. If you can’t find it, simply replace with any other leafy Asian green. We’ve been craving the fresh, vibrant flavours of Thai food lately and this lemongrass chicken recipe from MasterChef Alvin Quah really hits the spot! Leftovers make a great healthy lunch too. 1. Preheat oven to 180°C. Place the chicken and lemongrass in a large bowl. Drizzle with oil and gently toss to combine. Season with salt and pepper. just cooked through. Remove from heat and set aside for 5 minutes to rest. dressing and gently toss to combine. Divide evenly among serving plates. serve immediately, with steamed rice, if desired. 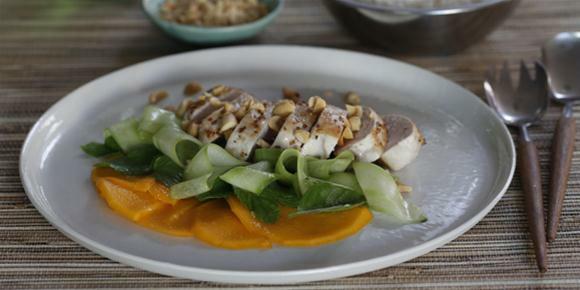 Tip: Instead of chicken, try salmon fillets or tuna steaks. Cook salmon or tuna on a chargrill, 2-3 minutes each side for salmon, or 1 minute each side for tuna. Almond milk is packed with antioxidants and vitamins which may help to reduce to risk of heart disease and even certain cancers. Here’s how to make the delicious drink to enjoy over cereal, in shakes or on its own. 1. Place the almonds, raisin and warm water in a blender, and blend on medium for about 1 minute. Strain mixture though a fine sieve and discard pulp. Note: If time allows, it is best to soak the almonds in water overnight before blending (strain and discard soaking water). Recipe: Kamalaya Hollistic Spa and Detox Resort, Koh Samui. What is your favourite healthy drink? Looking for a lighter dish after all that feasting? This delicious broth is also a great way to use up any leftover seafood – but can you guess how it’s so low in fat? Replace coconut milk with real coconut essence (not imitation) and light evaporated milk. 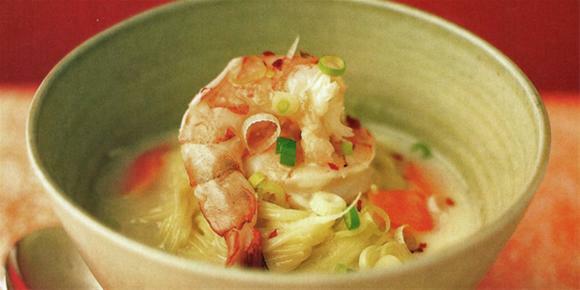 Ingredients 2 Tbs sunflower oil 2 Tbs laksa paste 375ml light evaporated milk 3-4 tsp coconut essence (we like Queen Natural Coconut Essence) 1/2 cup chicken stock 1 Tbs brown sugar 4 kaffir lime leaves 4 x 125g salmon fillets 400g cooked prawns, peeled, devained with tails intact 2 Tbs lime juice 2 Tbs fish sauce Method 1. Heat 1 Tbs oil in wok or large deep frypan over medium-high heat. Add laksa paste and stir for 20 seconds. Add light evaporated milk, stock, lime leaves and sugar. Simmer for 3 minutes. Add coconut essence and simmer for a further 2 minutes. 2. Meanwhile, heat remaining oil in non stick frypan over medium-high heat. Season fish. Fry for 1/2 minutes each side until cooked but still pink in the centre. Set aside. 3. Add prawns to pan and heat through for 1 minute. Add juice and sauce to broth and remove from heat. Divide seafood into shallow bowls, pour over broth and garnish with coriander. To make the soup even healthier, add vegetables like baby spinach, snow peas or brocolli florets at the end of Step 1. 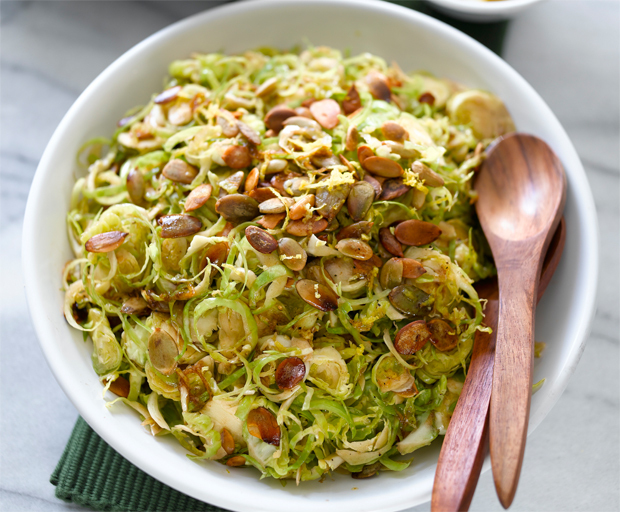 What are your favourite light dishes to enjoy during the holidays? Rub the chicken with garlic, salt and pepper. Heat chicken stock in a saucepan and bring to the boil. Then reduce the heat and add the chicken. Gently poach the chicken on each side for five minutes or until it is cooked. Remove the chicken from the pan and cover with aluminium foil to keep warm. Steam the beans for five minutes. Add the spinach with some sesame oil and crushed garlic and cook in a wok with a lid on for 5 minutes. To serve, place spinach on each plate and top with the whole beans. Slice the chicken breast diagonally and place them on top of the beans. Pour a little of the chicken stock over the top.Collette recommends you try to do fat-burning exercises like a boxing combo class or running for at least 30 to 40 minutes. You have to try and do this at least 4 times a week for it to be effective. If running and boxing aren’t your game then try to go for a long power walk and combine it with a pair of hand-held weights, this will increase the intensity. (you can buy hand-held weights at any sports store nationally).Another fabulous exercise is aqua aerobics which is great for total body toning and fitness. The great thing about water aerobics is that you actually don’t realise you are doing strenuous exercise. Now, you’ve got some exercises you might need the motivation. Get a friend to start exercising with you or invest in a personal trainer for a few sessions to get you on the right track and motivated. It might seem a lot of money initially but you will thank us for it when you’re feeling great and more alive. Finally, keep a record of your weight and then set yourself a target. Goals will get anyone to run. Good luck and don’t forget to write in and tell us about how you’re going.